We all knew perfectly well that the billionaire right-wing press barons and their lackeys in the Tory party would attempt to smear the hell out of Jeremy Corbyn during this election campaign. They hate his policies of standing up for ordinary people and repatriating vital British infrastructure and services out of the hands of multinational corporations and foreign government like China and Qatar. They hate his policies so much they're absolutely fixated on trying to destroy his reputation with anything they've got, and his early involvement in the Northern Ireland peace process is seriously the best they can come up with, because they know it feeds into the anti-Irish bigotry that still unfortunately exists in Great Britain. 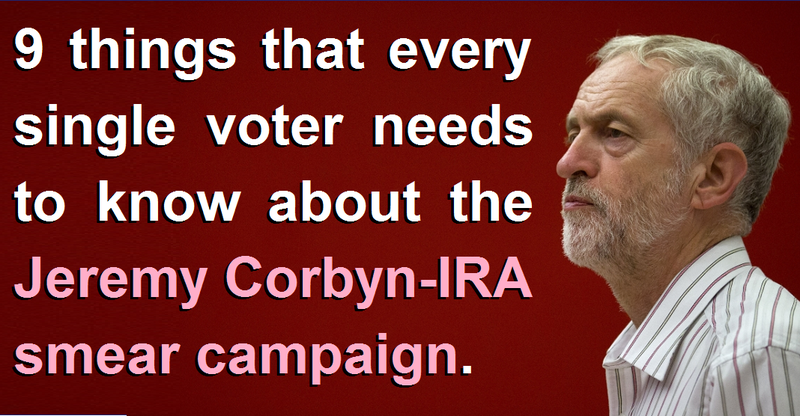 In this article I'm going to set the record straight by detailing 9 things that every voter should know about the Corbyn-IRA smear campaign. When Jeremy Corbyn was interviewed by Sophy Ridge during the 2017 election campaign he clearly condemned the IRA bombings, but the Tories outright lied that he didn't. Anyone who says that Jeremy Corbyn has "never" condemned the IRA bombings is lying through their teeth. In 1994 Corbyn signed a parliamentary motion on the 20th anniversary of the IRA pub bombing in Birmingham which described the attack as a deplorable terrorist atrocity. It's on the parliamentary record here for all to see. Anyone sharing pictures of Jeremy Corbyn with people like Gerry Adams or Martin McGuinness to "prove" that he met the IRA is either being thick, or totally disingenuous. Adams and McGuinness were not the IRA, they were leaders of the democratic political party Sinn Féin, which is the political wing of the Irish Republican movement, not the now-disbanded terrorist faction. People who share these pictures are either so blinded by anti-Irish bigotry that they can't differentiate between a political party and a terrorist organisation, or they know the difference perfectly well, but they're sharing the pictures in order to feed into the anti-Irish bigotry of people they consider to gullible and easily led. In 2013 Jeremy Corbyn was awarded the Gandhi Foundation International Peace Award for his efforts to bring about a peaceful solution to the conflict in Northern Ireland. You can read his acceptance speech here. The right-wing smear merchants are always desperate to bring up the fact that Corbyn met with Irish republicans, but they're a lot more reticent about the fact he also met plenty of Loyalists too in his campaign for peace. Corbyn met with Gary McMichael and David Ervine (Ervine was a jailed loyalist terrorist turned politician for the PUP), and he also spoke regularly with Ian Paisley who, according to his widow Eileen, considered Corbyn to be "likeable", "courteous", "polite" and "a gentleman". In light of the indisputable fact that Ian Paisley was a fierce opponent of Irish republicanism, why on earth would he say such things about a guy, who according to the Tory smears, was undermining the loyalist cause by promoting a peaceful solution to the conflict? Corbyn spoke openly to Irish republicans and Ulster Loyalists during the 1980s. Nobody is denying that. The problem for the Tories is that declassified records prove that Margaret Thatcher was secretly negotiating direct with the IRA terrorists at the time. The shocking thing isn't that she was negotiating with terrorists though, it's the fact that she outright lied to the British public over and again every time she repeated her "we do not negotiate with terrorists" phrase. People who attack Corbyn for openly talking peace, whilst refusing to condemn Thatcher's secret negotiations with the IRA, or the succession of lies she told to the British public are clearly as happy with secrecy and lies from right-wingers as they are furious with openness and honesty from left-wingers. If right-wingers really honestly cared about criticising politicians with links to the IRA, why is it that they're perfectly happy to have an ex-IRA terrorist and arms smuggler serving as a Tory councillor in Croydon? You can find more details on this ex-IRA Tory politician in this article, or by Googling "Maria Gatland" for yourself. Of all the people resorting to IRA-Corbyn smears, the crap-haired buffoon Boris Johnson surely has to be the most hypocritical. Not only did Boris share a picture of Corbyn with a member of Sinn Féin to "prove" that he met the IRA (refer back to point three and draw your own conclusions about whether Boris is being intensely thick or sickeningly disingenuous) he also claimed that this picture of Corbyn and McGuinness in the 1990s (while the peace process was really beginning to move forward) was proof that Corbyn is untrustworthy! 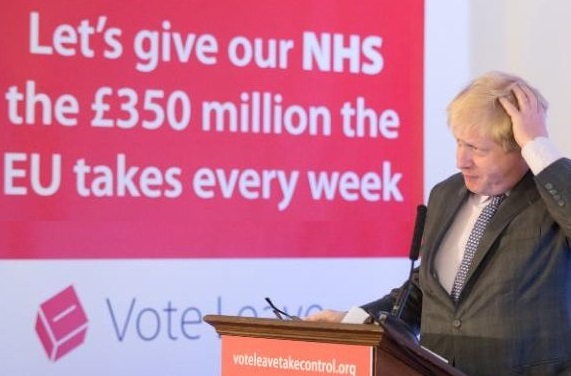 An accusation of untrustworthiness from a man who repeatedly lied that the NHS would get £350 million a week extra after Brexit! Even if you agree with Brexit, only the worst kind of political tribalist could possibly try to argue that Boris brazenly lying to the British public like that in order to swing the vote was acceptable and trustworthy conduct. Perhaps the most important point of all is the sheer desperation that these Tory-IRA smears demonstrate. They don't have any positive policies of their own to promote. They don't have any coherent criticisms of Corbyn's policies. So all they have left is a sickening smear campaign in the desperate hope that a combination of public fact aversion and anti-Irish bigotry is enough to put people off voting in favour of Labour's transformational manifesto. They don't have a single legitimate argument in favour of themselves, or against Labour's policies so they're resorting to the dirtiest muck-slinging tactics possible. Well take your time. Start at the beginning. I'm interested.